The latest addition to our Kraken-derived family of power cords is the TRYDENT. Equal in almost all respects to the A.S.P. Krakens smaller sibling, the A.S.P. Triton, TRYDENT employs pure silver AeroStrand ribbons, exclusive TriSilencer shielding technology and a slightly reduced granulated mechanical damping layer. 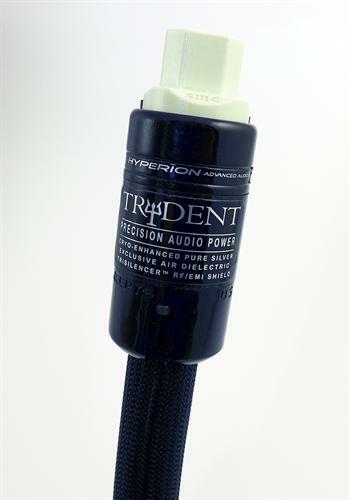 The TRYDENT also comes terminated with our own reference HYPERION AC and IEC plugs with carbon fiber housings designed exclusively for this model. Being almost internally identical, the TRYDENT has virtually the same current-handling capacity and shares most of the performance attributes of the A.S.P.Triton in a slightly more compact package with a lower cost. Make no mistake however, this is no inferior power cord, and even by being just below the A.S.P. Triton, it still dominates everything else in its price range. Stage III TRYDENT, an uncompromised, truly revealing and powerful cable for the most revealing and powerful audio equipment. TRYDENT power cords employ 4 large-gauge Cryo-treated, custom slow-extruded silver AeroStrand ribbon conductors. Air dielectric with PTFE Teflon air-tubes. Three level TriSilencer™ system shielding technology: full coverage plated copper; Mylar and conductive carbonized Nylon braid layers. Multi-layer construction with silica/ceramic/ferrite mechanical damping/shielding layer. Custom, exclusive polymer, handmade woven carbon fiber plug housings. Very high power capacity up to 30 amps.